Do you ever wonder how many of the emails you send to your newsletter subscribers get caught up in spam filters and junk mail folders? While checking my Gmail today, I was surprised to see how many marketers' messages – to which I'd subscribed – were in the spam folder. 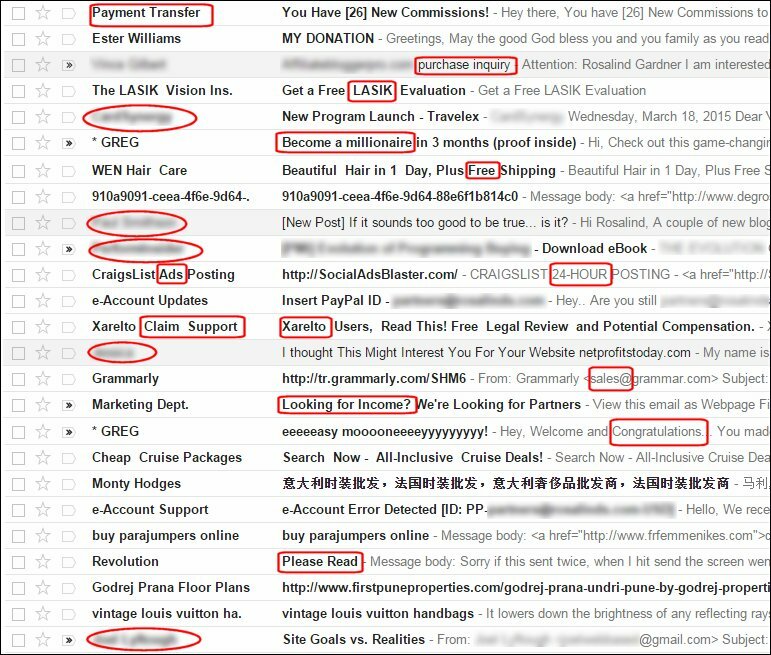 A quick scan down the list and it was easy to see why Gmail deemed those messages to be junk… they were rife with spam trigger words and phrases. Here's partial screenshot of what I found. I've circled and blurred the names of marketers (and affiliate networks) and placed rectangles around the spammy words and phrases. You'll notice that exclamation points, ALL-CAPS, and mentions of money (income, sales, millionaire) and medicine are all big no-no's. Here's a list of spam filter trigger words and phrases that you should try to avoid using in your email marketing campaigns. Yes, that is a very long list of spam words, but you don't have to remember them all. You can use SpamAssassin™, the spam filtering tool provided by Aweber. It automatically checks your message and displays key areas that appear to be spam and are caught by the filter. 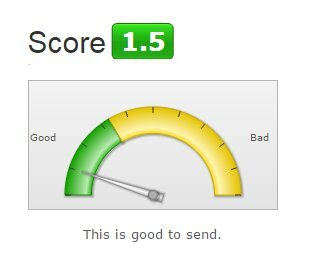 Aweber advises that any message with a score below 5 is OK to send. I am currently setting up my new aweber account today. Thanks for the info.